Here’s how to get pfSense 2.1 running on your WatchGuard Firebox X-core-e, including the x550e, x750e, x1250e, SSL 100, and SSL 500. I have personally confirmed that this procedure works on the x750e and SSL 500. All the WatchGuard X-Core-e models are largely identical with one notable exception. All X-Core-e models are 1U chassis loaded with a 1.3GHz Celeron processor, 512mb of DDR2 RAM, four Marvell 88e8001 gigabit NICs, a channel well power supply, and front-mounted HD47780 based character LCD. The x750e and x1250e add another set of four Marvell 88e8053 gigabit NICs, but all X-Core-e models can be upgraded to the same specification as the unpopulated area simply contains a block off plate on the x550e, SSL 100, and SSL 500. I believe the SSL 100 / 500 come with a (optional?) hard drive, but my SSL 500 arrived without a hard drive. After you receive your Firebox, you should verify that it works. This is simple – just plug the firebox in to AC power, turn the switch on, and watch the LCD screen. It should display “Memory Test Passed” after a short period of time, then proceed to boot the factory operating system. After a period of time, the display will switch to displaying the uptime. If you wish, you can plug each port into your network and confirm the LEDs for the applicable port light up. As we are replacing the OS, I will not discuss logging into the factory management interface. 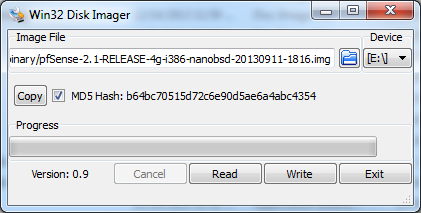 We will be installing pfSense Nano which is specifically built to run from flash memory (CF cards). To do this, we must disassemble the firebox, remove the factory CF card, and install pfSense to our own CF card. This process is further complicated by a bug in the Firebox’s BIOS which prevents it from booting from CF cards larger than 512mb; as all pfSense Nano images are now larger than 512mb, we must first change the BIOS settings prior to installing pfSense. Turn off and unplug the Firebox. Remove the four sets of three screws located at the front left, front right, rear left, and rear right (note that one of these screws is covered by a warranty label). Now remove the remaining two screws located high on the back of the firewall – the back being where the power cable plugs in. Finally, slide the top of the metal case towards the back of the firewall and lift up to expose the motherboard. Because the Firebox is designed to be rack mounted and accessed solely via the network or serial interfaces, there is no readily available direct video output. This presents a problem because the BIOS cannot be observed. Furthermore, no keyboard headers are available either, making it difficult to enter the BIOS in the first place! Several remedies are available – a VGA output & keyboard header exist on the motherboard, but are unpopulated; two PCI-e slots are also available into which an external video card can be plugged; but the easiest solution is to flash the BIOS with a version that redirects the output to the serial port. 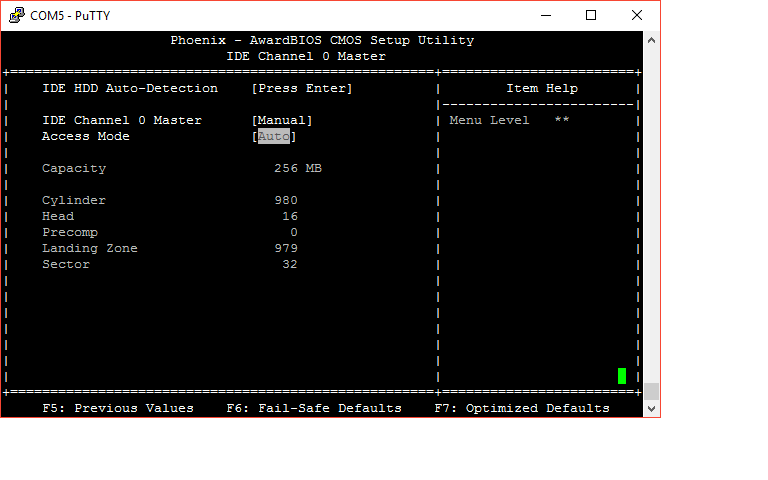 To access the utility needed to flash the BIOS, we boot into a pre-made FreeDOS image. Begin by downloading the FreeDOS image [here]. Make a note of where it is saved. Now download either Win Disk Imager which uses a simpler graphical interface or the potentially more powerful Physdiskwrite which must be accessed via the command line. Verify the MD5 checksum for the zipped FreeDOS image is 5ebb3f11925a8a78f7829e3ca0823f5d before proceeding. If using Win Disk Imager, extract the zip to a location of your choice and verify the .img file’s checksum is 86e32dc36d9d0098d11a5d15df05f586. You are now ready to write FreeDOS to a CF card of your choice ranging in size from 16mb to 512mb. *NOTE* The Firebox can be picky about what CF cards it will boot from. I tried several old SanDisk CF cards without success. The CF card that comes with the Firebox is guaranteed to work. If you wish to keep the factory image so the Firebox can be reverted back to factory operation, use Win Disk Imager to back up the card. 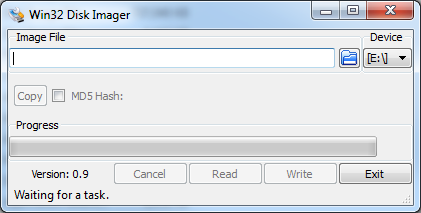 Click the folder icon to the right of the text box, then locate and select (“open”) your disk image. You will do this once with freeDOS and again with pfSense. 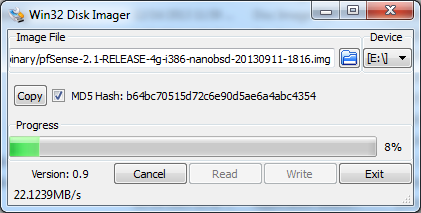 Click the MD5 Hash checkbox and verify the hash. This is optional, but if confirmed ensures your image is fully intact. You should see it start writing the image to the CF card. This may take a while and will vary depending on the speed of your CF card. You will be greeted with pop up window when done. Once the image has been successfully written to the CF card, remove the factory CF card from the Firebox and install your newly flashed CF card, being careful to line the card up in the tray – you don’t want to bend the pins! Now plug your null modem cable into the front of the Firebox and into your computer, using the USB-to-serial adapter if necessary. Fire up your terminal program of choice – I like PuTTY – select your serial port, and set the connection speed to 9600 baud (bits per second or BPS), 8 data bits, 1 stop bit and no parity bit (hereafter abbreviated 8N1). If using PuTTY, the default settings work. Don’t worry if you don’t know the exact serial port – it can be a trial and error process. The device manager may provide clues if you need help and most USB-to-Serial adapters are listed above COM 4 (e.g. COM 5 or COM 6). I’m lucky my Dell Latitude D620 comes with a hardware serial interface and it is listed as COM 1. Switch on the power to the Firebox and you should hear 3 beeps after a short period of time. If your terminal is configured correctly, you will be welcomed by an MS-DOS prompt. It is now time to flash the BIOS so that it will read the higher capacity CF card needed to run pfSense. 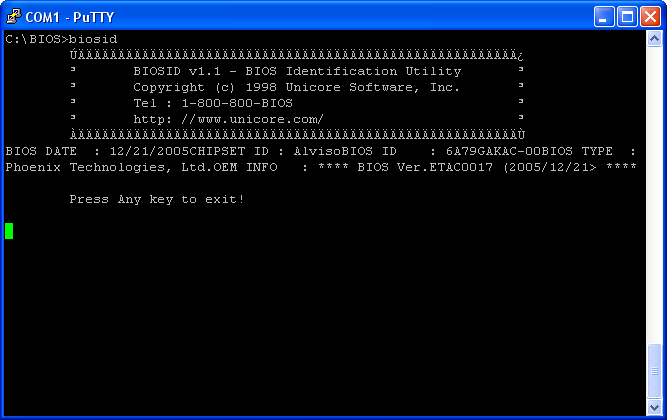 First, confirm that your Firebox is like the rest by running “biosid” or BIOS ID(entification). It is important this information matches my screenshot – if it doesn’t something might be different about your Firebox and flashign the BIOS could render the machine useless. Next, backup the existing BIOS to the internal CF card by running “awdflash /pn /sy backup1.bin /e” like so. “backup1.bin” can be any name of your choosing. You are done when the DOS prompt returns. Don’t worry if it takes a while as this will vary depending on the speed of your CF card. If in doubt, leave the Firebox running – turning the machine off prematurely can corrupt the BIOS and leave you with an expensive red doorstop. At this time, you may also change the fan speed to ‘BB’ to help quiet the fans during the boot process. Once pfSense is running, an additional script may be loaded to dynamically vary the fan speed, resulting in a near inaudible Firebox. With the BIOS hurdle out of the way, it is time to download and flash pfSense. This process closely follows the process used to flash FreeDOS. First download your pfSense image of choice from here. You want a pfSense “Nano” image which is specifically built to run from flash memory. Choose the version appropriate for your flash card – 512mb for a 512mb card, 1g for a 1 gig card, 2g for a 2 gig card, or 4g for a 4 gigabyte CF card. The Firebox runs on x86 hardware with serial console output instead of VGA, so choose an i386 build without the vga tag. If you use the 4 gig card I recommended above, download “pfSense-2.1-RELEASE-4g-i386-nanobsd-20130911-1816.zip” (newly updated link! – MD5 hashes here). Verify the MD5 hash for the unzipped .img file is B64BC70515D72C6E90D5AE6A4ABC4354 before proceeding. With the pfSense image in hand, insert your new, large CF card into your card reader and following the procedures above, flash pfSense to the card with either Win Disk Imager or physdiskwrite. It will take longer to write the image to the card this time as pfSense is a much larger program than FreeDOS. Once completed, ground yourself, unplug the Firebox, remove the old FreeDOS CF card and insert your newly flashed pfSense CF card. It is now time to boot pfSense for the first time. Make sure your null modem cable is connected and fire up your terminal (hyperterminal, PuTTY, etc). Like before, connect at 9600 8N1 and turn on the Firebox. After the POST, you will see pfSense begin to boot, eventually landing on the initial configuration. Here you will configure your WAN, LAN, and additional ports. Ports 1-4 will be mapped to interfaces sk0 – sk3. Ports 5-8, if available, will be mapped to interfaces msk0 – msk3. Be sure to put your critical network devices on the sk interfaces – the msk interfaces have been known to have stability issues in the past. Once you have your WAN & LAN connections setup, you can plug your computer into the LAN port, navigate to the Web UI, and configure your new pfSense firewall – but that’s another article. Several further enhancements exist to improve functionality of the pfSense flashed WatchGuard firewalls. Community support has been integral in implementing fan control to help quiet the banshee like howl of the fans; with healthy fans in a residential environment, the fans slow down to a whisper (stay tuned as I am working to release an enhanced version of the fan control!). So too has the community found a way to enable the LCD, and buttons, on the front of the firewall, making this mod feel factory once complete. Beyond software mods, hardware additions also exist. On the SSL boxes & the x550e, it is possible to add the extra NICs found in the x750e and x1250e for additional capacity. Because the entire firewall is a specialized x86 computer, the processor and memory can be upgraded. If you are using the box as a VPN gateway, hardware encryption cards pop right in although support is in the air. Finally, a hard drive can be added which supports more advanced features of pfSense, like squid caching to help reduce the load on your external connection. Most of this is overkill in a residential home – the benefits become apparent in a small business environment and above. Look for a future post detailing how these improvements. Do you have a back up copy of the original bios? If so could I possibly get that from you? I’m looking right now – unfortunately, I wouldn’t get your hopes up. I don’t have the backed up BIOS on my desktop… I’ll be sure to let you know if I locate the files! Can you access the serial console at all? Your problem looks to the be the same as this post on the pfSense forums https://forum.pfsense.org/index.php?topic=76385.0 He resolved the issue by using a new 4gb CF card – what CF card are you using, is it new, what image are you using, and where did you get your image? I need some help. I have followed the steps but I am stuck. I have flashed the bios but however when I boot it and open my serial port to 115200 it outputs what seem to be random strings. It then goes on and boots the FreeDos what is contained on the CF card and outputs data to 9600 serial connection. Once booted if I run (biosid) I get. Press Any key to exit! 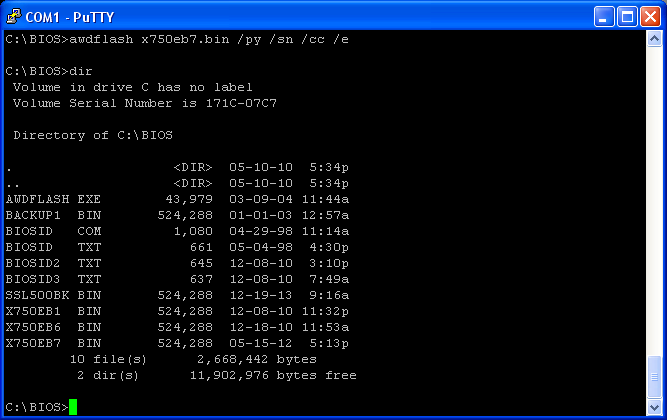 This is the output of the system on 115200 with the modified bios. Hi, I’ll play with mine and see if I can help you. In the meantime, which custom BIOS did you flash? I recommend trying the version that writes “pfSense B7” to the front LCD which will serve as visual confirmation the flash was successful. Generally the random characters mean the bitrate is set incorrectly and your terminal program (PuTTY) cannot interpret what your Firebox is saying. Also, I can confirm these steps should work on the x750e as that is what I originally developed these steps around; I filmed the SSL 500 on the second go, but it is functionally identical. I have since re tested this trial on a different computer it seems it must have been my adapter not allowing the correct data bud rate to be set. Thank you for all your help, and this tutorial. HI, I am having a problem finding the download that matches the MD5 hash match. Your link brings up a cannot find page. Could you guide me to the right file? None of the others are willing to boot. I apologize for missing your response. It looks like pfSense is no longer hosting version 2.1 and has instead moved forward to version 2.1.5. This version http://files.nyi.pfsense.org/mirror/updates/pfSense-2.1.5-RELEASE-4g-i386-nanobsd-upgrade.img.gz with an MD5 hash value of 99680eccfce6dca7123476c7abfdfb8c should work. I will update the article shortly. I’ll also look into hosting a backup of 2.1, but you really should use the latest release as it incorporates several important security updates. hello, i tried with a usb cable to db9 adapter and with an older computer with serial port, but don’t work el freedos boot, only a one beep from the watchguard X750e Core X. the null cable is a special settings ?? thanks. The null cable should work with the settings posted above. It sounds like FreeDOS is not booting at all – make sure you are using a compatible CF card and that the FreeDOS image has been successfully flashed. If it still doesn’t work, try resetting the BIOS on the Firebox by removing the CMOS battery for a while with the Firebox unplugged or by using the onboard jumpers (I think the Firebox has them, but I don’t have one in front of me for reference). thank you, i buy a new cf card (kingston 8GB), and don’t work, either. finally i used the original sandisk cf card (256 mb) and work ok.
on a 550e once I flashed the FreeDos my system doesnt boot, I get only 1 beep. it had a 512MB CF card and I used that card for the FreeDos. any idea? Hi, the 512mb card should work, but I am concerned it is not original as all of my fireboxes have come with smaller cards. Was the warranty seal intact? I was unable to use my other small CF cards with FreeDOS. However, the first thing I would recommend is to clear the BIOS. I think there is a jumper on the motherboard for this purpose, but another easy way to clear the bios is simply to unplug the firebox, remove the battery, and wait a few minutes. If this doesn’t help, try flashing FreeDOS with physdiskwrite instead. If it still doesn’t work, you will need to experiment with other CF cards. I wish you luck! 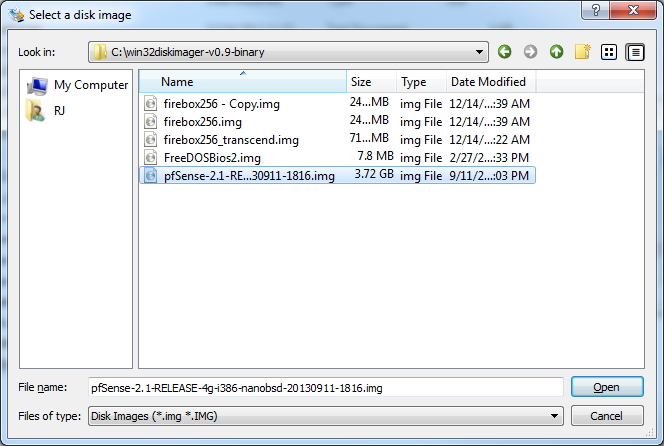 Use Win32 Disk Imager to create an image of your existing card (press the read button). I couldn’t get any CF cards except for the original card that came with my firebox to boot into freedos. If you look closely at the screenshots I posted above, you’ll see I imaged my factory CF cards too. I’m looking for a Windows solution – hopefully someone else can chime in. I keep coming up with the *nix utility dd which should do the trick. Although this is late and I am sure you have moved on – My card said the same thing about formatting it *DO NOT FORMAT THE CARD* what you need to do is open the DiskImager and where it says image file press the folder navigate to where you want to save it and click ok then type a name (for mine I used the firebox model + “_ORIG” so something like x700_ORIG. The read button should allow you to press it after you do that. I have not been able to get this x550e to boot with the freedos image written to the 256mb cf that I bought or when I flashed the 512mb that came with the system. I have flashed back to the backed up original image and still will not boot? any help would be great! Ok, let’s go back to the beginning. You have an x550e and it came with a 512mb card. Did it boot when you got it? Does it have a hard drive? Was the warranty sticker over the CF card intact before you removed it? Did you confirm the MD5 hash for the freedos image matches what I posted? Unfortunately it’s hard to troubleshoot this remotely. If it has a hard drive, I’d remove it. Reset the BIOS (pull the button cell battery for 15 minutes with the firebox unplugged from the wall) and try again. If the warranty sticker wasn’t intact and it still won’t boot, I’d try hunting down an original CF card because I certainly had a lot of trouble getting other cards to work for freedos. If you *still* can’t get it to work after trying different computers, CF readers, and CF cards, it’s possible to install a PCI-e graphics card with an adapter or the motherboard removed so that you can get screen output. That should be a complete last resort. I have found after the flash when you reboot sometimes you have to set putty or HT to 19200 not 115200 then when you have made the changes in bios save exit then change putty 115200. Any one know why the 750e does not support 4gb ram as the CPU does? Do you have the process to adjust fan speed after initial bootup? 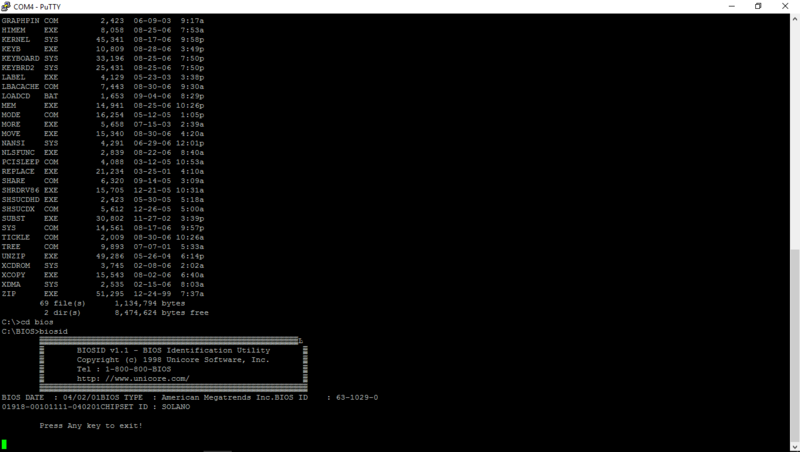 You can also download shellcmd and add “/usr/local/etc/rc.d/fanctrl.sh start” so that WPXepc starts at boot. temp we need to keep the FB below ? I’ve heard that you shouldn’t set the speed less than BB in the BIOS as it will cause stability problems, but I don’t think it was due to overheating. Keep the temperature under 50*C and you won’t have any problems… for most people, the firebox will stay cool with the fan barely running. With mine at 10, it’s reporting a 43*C temp. These were built to be run in a datacenter where temperature is sometimes an issue and they are loaded far heavier than what they will likely experience in a home setting. hi i just got an 8gb kinstong card and I cant get it to boot pfsense, i used my stock 256mb card for freedos but i cant find pfsense that fits on 256mb so i figured i needed the 8gb. I also set the bios with header 2 and still nothing. I successfully mounted Freedos and flashed via PuTTY. However when I go to the next step by connecting at a higher baud rate (115200) I get nothing on pressing tab after the first beep. I’ve tried at 19200 but I get a string of random crap. However, booting at 9600 I get the usual Freedos screen. Do you know what I need to do next? I’m a bit confused as to why it’s not talking at 115200. Ryan, try clearing the BIOS. I think there’s a jumper on the motherboard; if not, just pull the battery with the A/C power disconnected and wait 15 minutes. You should see output (the POST) even before pressing tab – if you’re getting nothing, either console output is disabled or there is another problem. I gave up on this one but I’m willing to try again as I have had the unit sat doing nothing for… Two years it seems! What should I do to enable the console output? Surely this would be enabled if I’m getting Freedos to appear in PuTTY at 9600? This worked great for me! Any updates on getting this to work with pfSense 2.2? I’m glad to hear it! 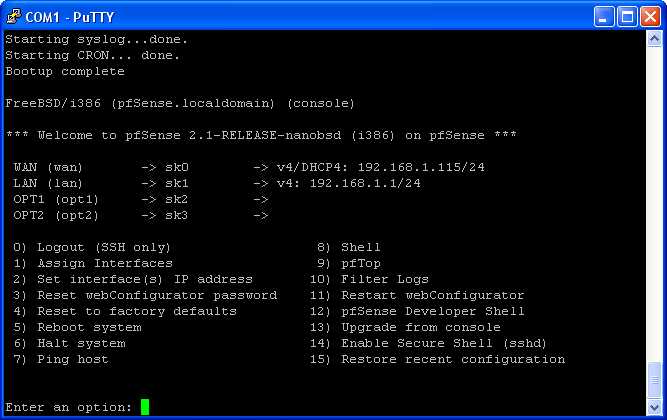 I’m working on a pfSense 2.2 write-up now and hope to have it up mid-late May. I’m wrapping up my master’s degree right now and can’t devote as much time to this site as usual. I’ll also have an OPNsense (a pfSense fork with a cleaned up code base and a better interface) write-up once the July release drops. so, you mean to flash bios 8.1? where I can get this? Does anyone have a image of the original Watchguard OS for the x550e ? My x550e came with IPcop installed when i bought it from Ebay. I want to compare the troughput between the watchguard OS and Pfsense. I’ve Followed all these step (with the newer Pfsense 2.2.4 and 2.1), And I keep getting Time zone errors as well as config is corrupt, I am unable to do anything after getting PFsense to load. It just keeps giving me these errors. I am unable to get past the BIOS flash stage at the moment! I have an x550e. I have written the FreeDOS image to the original 128MB CF card. I have checked the BIOS with BIOSID and it matches the description above, however, running AWDFLASH just causes it all to hang! I feel like a total noob. Where do I go to download bios 8.1? I have successfully flashed the BIOS and changed the proper setting on the stock 256MB CF card. Now using a Kingston 4GB (new) and pfsense 2.1, I am stuck in the Booting OS.. Is there any way to be sure it’s the CF card ? Is there any other BIOS settings to try ? Here in Canada, the recommended CF card is 67$ ! Does this box work fine with newer release of pfsense? any experiences using XTM 810 with pfsense? Hi I have a x500. can you suggest or point me towards the correct BIOS update file for this device. Do I use the x750e firmware on the x1250e box? If not where do I get the x1250e firmware from? X750e and X1250e use the same firmware. https://uploads.disquscdn.com/images/06a83ef4bf2d068aa0e3025a8edffdc00d134a9fa23ccc8a9164cf18959d6216.png I have an X1000 firebox that i am trying to flash freedos bios to but i am finding the bios id is far different. Is there a different version of freedos bios i should be using than the one shown in this article? Any way to install 2.3.3? I have gone through everything and flashed it with 2.3.3… Garbled text on my Putty console. Do I need a newer BIOS? It’s been a while. You may have to change the access mode (PIO)? I hope you’ve found the answer by now! I’m going to scour the web for signs of bios setting and CF card combinations and see if I can make any headway. Thanks a bunch for all of the information you have here! Hello thank you for the guidelines and for posting the link of the material used. However one question, how do you rollback on using the default Watchguard application? Hi – if you made a backup of the original Watchguard CF card, you can flash that backup to another CF card using windisk imager. It should then work exactly as it came from Watchguard. I was wondering.. the PCIe x4, is it able to handle a PCIe x4 Flash drive (SSD) card/adapter? Does anyone have a backup of the original BIOS image from an x750e or x1250e system? I want to go back from running pFSense to the original Fireware BIOS.